Practice Fusion is the frontrunner in the fevered race to become the electronic medical record platform, and today it finished raising a $34 million Series C led by hedge fund Artis Ventures to make sure it wins and lead it towards an IPO. Practice Fusion’s valuation is now around a half a billion dollars, it tells me. Startups trying to compete? “We’re squashing them” founder and CEO Ryan Howard tells me. It now hosts 40 million patient records of its 150,000 doctor and other medical professional clients, up from 25 million records and 130,000 clients seven months ago. Practice Fusion develops a free, web based electronic medical record platform for physicians that lets them chart data, schedule appointments, electronically prescribe medicine, work with labs, and distribute referral letters — all things that can get in the way of actually helping the sick. It makes money by letting labs, pharmacies, and other service providers to doctors pay to advertise within the platform. 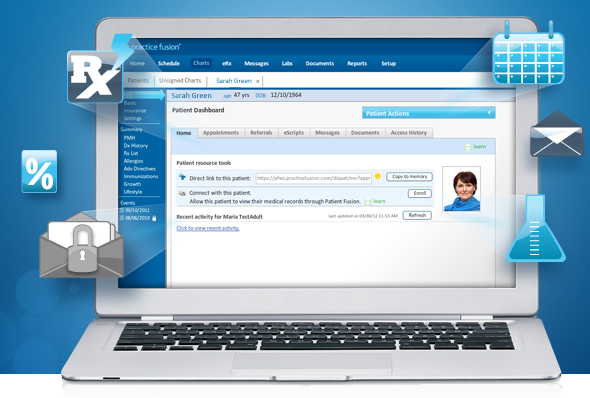 There’s both a Practice Fusion desktop interface and iPad app for doctors. Howard was careful choosing Artis Ventures to lead the round, telling me “it’s a wedding. You’re married to that investor. Artis is a hedge fund with a venture fund. It’s preparing us. It’s who would be buyers in a public market” indicating the company has its sights on an IPO. Artis also backed YouTube. Practice Fusion now has a total of over $64 million in funding, and Howard admits, “We have a lot of cash on hand.” The full list of investors joining the Series C round includes long-time investors Felicis Ventures and Band of Angels, plus Glynn Capital, Ali and Hadi Partovi, Founders Fund, Morgenthaler Ventures, Scott Banister, SV Angel, Ghost Angel, and several other institutional and individual investors. Practice Fusion now ranks amongst Castlight ($160 million), and ZocDoc ($95 million) as the most heavily funded health startups. It needs it at the rate its growing. Howard tells me “we brought on about 20 people last month”. It’s got 170 employees now and expects to have 250 by year’s end. Hiring employees that quick is tough right now. “It’s more competitive than ever, especially for engineers” says Howard. But its applying its funding to becoming an attractive place to work, even compared to perked-up giants like Google and Facebook. That’s why it’s investing in a gorgeous San Francisco office, wellness programs, healthy food, and more.